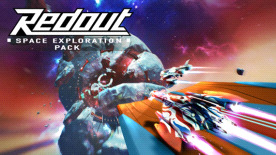 Redout - Space Exploration Pack adds the two latest racing complexes to your Redout experience. The SRRL headquarters decided to investigate new forms of anti-gravity racing, pushing the boundaries of space travel to the limits of the Solar system. Start from the Moon. Here you can experience the roots of human space colonization, the consequence of desperate terraforming attempts, the sat comm arrays and the gigantic reactors creating an artificial, thin atmosphere. The new Moon Environment, with 5 tracks and a new Boss track. The new P-AR219 Environment, with 5 tracks and a new Boss track. New Zealand, Formula and Smudge liveries for all your ships!